Hey guys…it doesn’t get any better than this!!!! 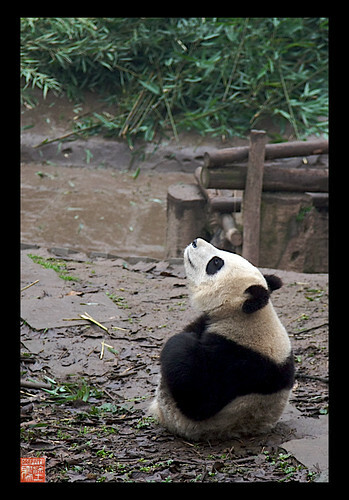 I hope it was worth the wait for you to get to see some of the panda center pix. Below is a video I did this weekend dedicated entirely to my adopted panda Bao Shi at the Chengdu Panda base. Many more pix to come this week as I get through processing them and picking my faves. 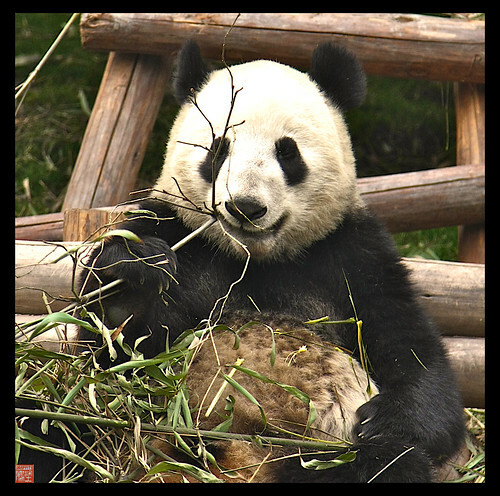 The jet lag has been terrible but whiling away the daytime hours revisiting the pandas and Chengdu via my photographs and video has been a great way to keep awake! Be sure to turn on your audio!! We were treated to a Chinese New Year Feast in a private room with some of the head staff and vets and all the food and Chinese wine and spirits we could drink. I honestly don’t remember all the toasts …there were lots of them!! Chinese wine could take the paint off of your car….and yes, we drank plenty of it! The muddy panda you see with the scar on his face is the one I am working on fundraising for here on the blog. We are half way to our goal but need much more to be able to finalize this adoption asap. Thank you all so much for your help so far. I still need to ID him but he just seemed to need a special family and a good bath too! !…..little old pig pen I’ll call him for now. Use the CHIPIN widget in the right column to donate 25.00 or more towards our group adoption and thank you so very much for your participation. 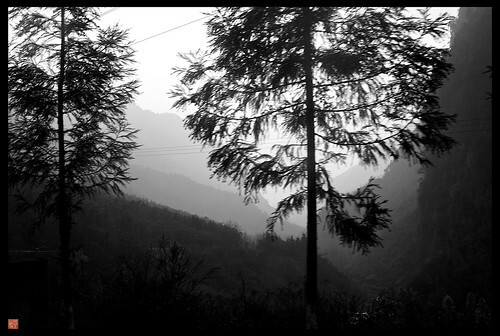 There is a lot of bamboo that needs planting for food and many new enclosures to build in Bifengxia. 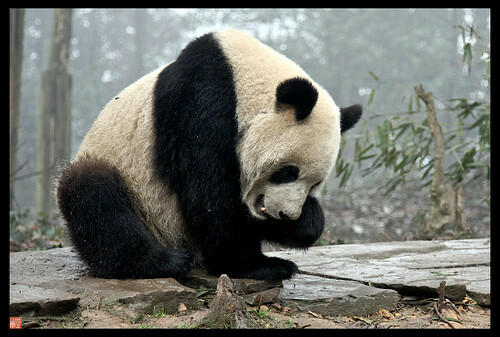 Your small donations when added up will make a big big difference for the future of the Giant Panda!!! 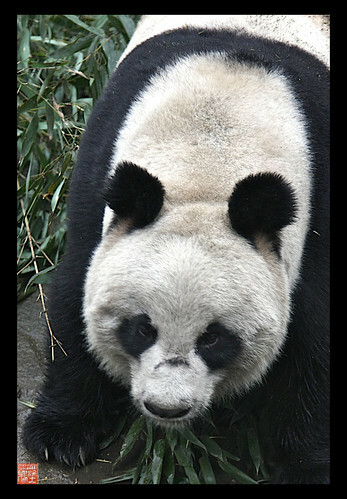 THE GROUP ADOPTION PANDA WE ARE SPONSORING..THERE IS STILL TIME TO JOIN THE PROJECT! There was no one around who spoke English during our tour to ask names of the pandas. Some of the plaques with the pandas remaining at Bifengxia were the wrong ones since I knew who was in Shanghai. It looked like they let some of the older adults take over their spaces for the time being. 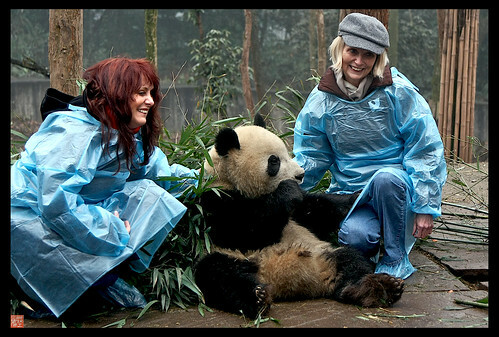 More pix to come from Chengdu Panda base……those will take me some time to go thru!! 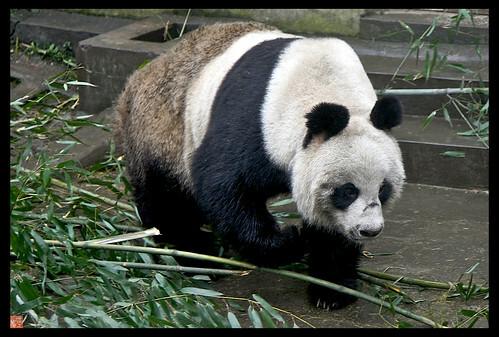 The panda we pictured with above is from Bifengxia. We were so lucky to get to have our photo taken with him!! 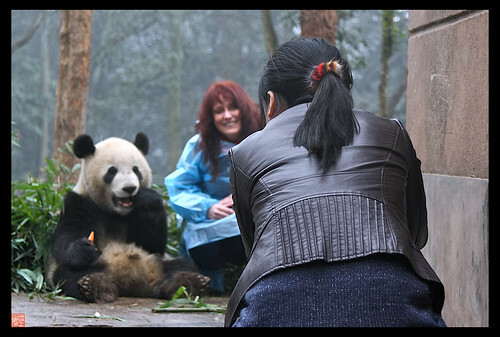 At first we were told no photos with pandas because of H1N1 …….the panda base was deserted that day and I’m sure it was because of Tais arrival. Guards everywhere and not a tourist is sight. He had just arrived the night before we did. Even with all the planning and correspondence I did with Dr Tang and Suzanne etc, it took hours to finally gain entrance to the center!. 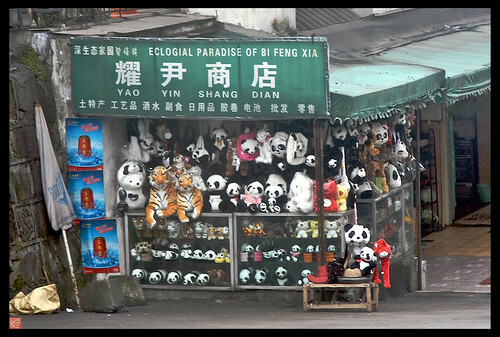 I was sure we would not get to see pandas at Bifengxia and we were getting ready to leave……. Hours later after standing at the gate what seemed forever, when one of the staff recognized my photo from my business card…., she put 2 and 2 together, saw how much fundraising I had done (as well as Gayles adoptions) in her computer records……. and we then made up for lost time. I’m sure by the time my friend Chet gets to Bifengxia this week , many of the Tai police will have disappated and security not such an issue For us is was just a case of bad timing with Chinese New Year on top of everything. 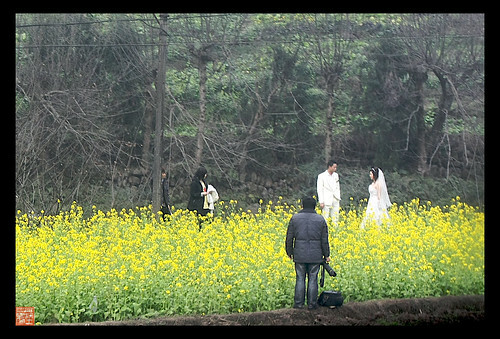 ABOVE IS THE BIFENGXIA SCENERY……..ABSOLUTELY GORGEOUS!! We were not allowed within sight of Tai Shans quarantine enclosure OR his villa he is to end up in soon. Sorry guys…I really tried to get photos but with speaking English a rare commodity,….it was a challenge just getting inside even with our driver Mr Li, Mickal on the cell phone in town, and Ying Ying , Mr. Li’s daughter who spoke English running interference!!!! With teamwork and persistance we at least got in the center thank goodness. It was a very fun day all in all. I would love to spend more time in the area on my next trip there. Thank you for the beautiful video! 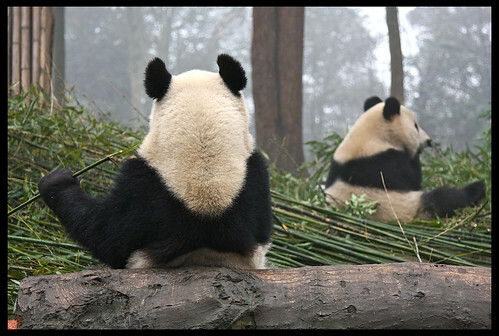 THANKS A LOT Sandra for these so marvellous photos of pandas. 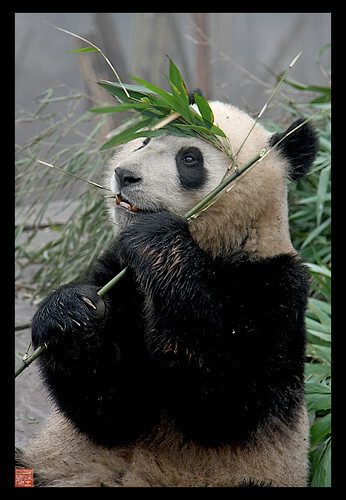 The panda with a black mark on the bridge of her nose is BaiXue. It’s not a scar but a misplaced black fur. Tai Shan will be her neighbor. She is the mother of ChuangChuang who lives in ChiangMai zoo. 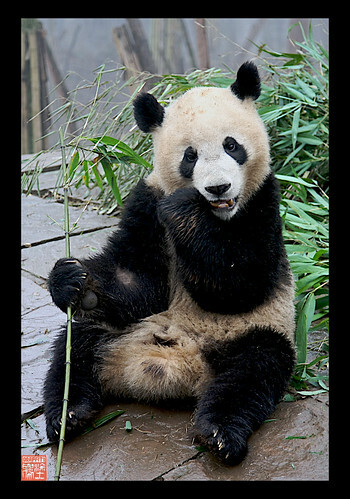 Baixue is from the wild and once ran away from Wolong and reappeared after being absent for 5 years. She gave birth last year. Her age is estimately 20 years old. I saw her and her cub at the maternity ward in January. Thanks so much topaz Genevieve and karom. Interesting about the black birthmark on this panda. I will have Carrie confirm with the panda club and we will have our. Girl to adopt!!!!! Thank you so much for the wonderful video and pictures! I’m excited about the beautiful panda you’ve chosen for the Yin Yang adoption!…I love the unique “misplaced” black fur on her nose 🙂 Thank you to Karom for telling us about BaiXue.